On November 15th, British Columbians will go to the polls to vote for local leaders to represent their communities. While local elections may not generate as much attention on the airwaves or around the water cooler as provincial and federal races, they are vitally important – and not only at the local level. Newly elected mayors, councillors and regional representatives will not only make countless decisions that will affect daily life in our communities – they can also play a major role in a much wider political arena. For many of us concerned about the local and global impacts of pipeline projects and other fossil fuel development in BC, it increasingly feels like the provincial and federal governments are simply not listening. But communities like Burnaby (which is using all the mechanisms at the city’s disposal to prevent the Kinder Morgan pipeline expansion, including a drawn-out legal battle to prevent the company from carrying out invasive surveying work on Burnaby Mountain conservation lands), or Kitimat (where last April, citizens rejected the Northern Gateway project in a plebiscite) are showing us how local governments can flex some serious political muscles and be influential players in this vital national conversation. 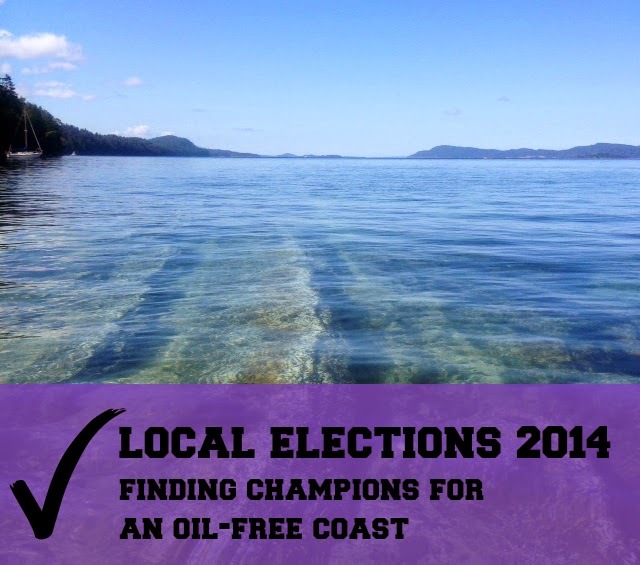 We need more local champions like these, and the upcoming municipal elections are an important opportunity to spark community debates about the risks and benefits of Kinder Morgan and other energy projects, and for citizens to choose representatives who will stand up for the rights of communities over fossil fuel companies. Georgia Strait Alliance is working in strategic locations around the Strait to encourage such debates during the election period, and in particular to raise awareness among candidates and voters of the risks coastal municipalities would face in the event of an oil spill. If you live on the Sunshine Coast or the Nanaimo and Parksville areas,click here to find out where your candidates stand on these issues, and other useful information as you prepare to vote on November 15th. If you have five minutes: ready, set vote! Visit your municipality’s website and make sure you know when and how to vote. Talk to your friends and family and make sure they’re ready to vote as well. If you have half an hour: write an email. Contact your candidates (see here for an email directory of candidates running across the province) and ask them their views on issues of concern to you (you can use our candidate survey as a guide). You could also consider writing a letter to the editor of your local paper – a great way to contribute to the debate in the wider community. If you have an evening to spare: attend an all-candidates’ meeting in your area to find out more about your candidates, and ask them questions about what matters to you (feel free to use ours). Your local newspaper or municipality’s website is the best place to find out dates for the meetings. If you would like help with any of the above – who to contact, what to write, no question is too big or too small – we’re here to help! Contact alexandra@georgiastrait.org or call 604-633-0530. Whether it’s pipeline and tanker projects that worry you, or other local environmental or community issues, November 15th is too important an opportunity to miss – so mark your calendars, and get out and vote!